Find sprinkler provisions fast with time-saving, sticky Index Tabs for the NFPA 13 or the Automatic Sprinkler Systems Handbook. Put the latest sprinkler requirements and expert advice at your fingertips. 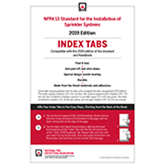 NFPA 13, Standard for the Installation of Sprinkler Systems is fully reorganized for the 2019 edition based on user needs in the modern built environment. Add these self-adhesive Tabs to the standard or the Automatic Sprinkler Systems Handbook to help shorten the learning curve and start maximizing your time right away. Note that the 2016 tabs will also work with the 2013 Standard or Handbook.